The Day Wallis Supermarket Opened - a Memory of Aveley. My family moved to Aveley in January 1967, when I was three weeks old. We lived in Manor Close, where in fact my older brother still lives. One memory I have of High Street is the day when Wallis Supermarket open, I think it must of been around 1975, as I can remember being in the playground of the Junior school when an open topped car drove by with Alice in Wonderland and the Mad Hatter sitting inside. I remember when mum came to pick me and my sister up from school, we went into the brand new supermarket which was much bigger than what we had in Aveley at the time (Key Market on the corner of the High Street and Ship Lane, the Co op in Purfleet Road and VG's). Over the 30 odd years, Wallis changed into Internationals which then became Gateways. It's also been Kwik Save, Somerfields and now is the Co operative. 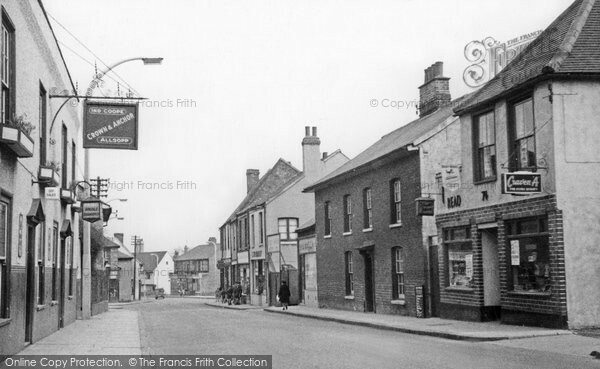 Something which is sad is that when I was a child Aveley had four butchers (Hitchcocks and Clarke's in the High Street and butchers in both Hall Road and Romford Road) but due to the supermarkets we now have none! A memory shared by John Livermore on Jun 17th, 2011. Send John Livermore a message. I wonder if this was the same chain this would probably closed around the early seventies.